Arizona. Yuma, Pima and Maricopa counties. i. USDA trigger point for a countywide disaster declaration is 30 percent crop loss on one or more crops. Drought has destroyed or damaged crops in at least 53 counties across five states: California, Maine, Massachusetts New Hampshire and Vermont. New Hampshire. Belknap, Carroll, Cheshire, Coos, Grafton, Hillsborough, Merrimack, Rockingham, Strafford and Sullivan. Massachusetts. Essex, Franklin, Middlesex and Worcester. Vermont. Caledonia, Essex, Orange, Windham and Windsor. All counties listed above were designated crop disaster areas on Dec. 23, 2015. Beginning January 7, 2015 USDA has declared crop disasters in at least 4,017 counties and county equivalents across 46 States [as well as Puerto Rico, and US Virgin Islands]: Those states are Arizona, Alabama, Arkansas, California, Colorado, Connecticut, Delaware, Florida, Georgia, Hawaii, Idaho, Illinois, Indiana, Iowa, Kansas, Kentucky, Louisiana, Maine, Massachusetts, Michigan, Minnesota, Mississippi, Missouri, Montana, Nebraska, Nevada, New Jersey, New Hampshire, New Mexico, New York, North Carolina, Ohio, Oklahoma, Oregon, Pennsylvania, Rhode Island, South Carolina, South Dakota, Tennessee, Texas, Utah, Vermont, Virginia, West Virginia, Washington and Wyoming. About 99 percent of the 2015 crop disaster designations have been due to drought so far this year. Areas across the Contiguous United States covered by “Abnormally Dry” (D0) to “Exceptional Drought” (D4) levels have extended by about 10.4 percent since last week, according to the U.S. Drought Monitor. The latest statistics for total US are 53.02 percent of the area as of October 20, up from 48.69 percent previously. “Significant rain began to overspread the south-central U.S. on October 21, a day after the drought-monitoring period ended, and will be reflected in next week’s U.S. Drought Monitor.” said the Drought Monitor. The U.S. Department of Agriculture (USDA) has designated five counties in the two Virginias as crop disaster areas due to losses and damages caused by drought that occurred from June 1, 2014 through Oct. 31, 2014. Virginia: Highland, Augusta and Bath counties. West Virginia: Pendleton and Pocahontas counties. Beginning January 7, 2015 USDA has declared crop disasters in at least 736 countiesiii across 14 states: Arizona, California, Colorado, Idaho, Kansas, Nebraska, Nevada, New Mexico, Oklahoma, Oregon, Texas, Utah, Virginia and West Virginia. All of the 2015 disaster designations so far are due to drought. v. The disaster designations posted above were approved by USDA on February 11, 2015. The U.S. Department of Agriculture (USDA) has designated a total of seven counties in the Lone Star State as crop disaster areas due to severe drought. The crop disaster designations are for El Paso, Kleberg, Brooks, Hudspeth, Jim Wells, Kenedy and Nueces counties. Beginning January 10, 2014 USDA has declared at least 2,262 separate crop disasters across 33 states. Most of those designations are due to the drought. ii. The total number of counties designated as agricultural disaster areas includes both primary and contiguous disaster areas. iii. Counties may have been designated crop disaster areas more than once due to multiple disasters. v. The disaster designations posted above were approved by USDA on August 27, 2014. The U.S. Department of Agriculture (USDA) has designated a total of nine counties in Washington state as crop disaster areas due to severe drought. The crop disaster designations are for Yakima, Benton, King, Klickitat, Pierce, Grant, Kittitas, Lewis and Skamania counties. Beginning January 10, 2014 USDA has declared at least 2,255 separate crop disasters across 33 states. Most of those designations are due to the drought. v. The disaster designations posted above were approved by USDA on August 20, 2014. Snowpack provides about a third of the water used by California’s cities and farms. As of April 15, 2014, the California statewide water content of snowpack stood at only 24% of normal, according to the Department of Water Resource. Drought causes water famine leading to crop disasters. It degrades water quality, and leads to surface and groundwater level declines, land subsidence, soil erosion, intense wildfires, humongous dust storms, and spread of disease. Water years 2012 and 2013 were dry statewide, especially in parts of the San Joaquin Valley and Southern California. Water year 2014 continues this trend. California’s Water Year 2014 (October 1, 2013 through September 30, 2014) has been one of the driest in decades and follows two consecutive dry years throughout the state. In most years, California receives about half of its precipitation in the months of December, January and February, with much of that precipitation falling as snow in the Sierras. Only a handful of large winter storms can make the difference between a wet year and a dry one. Warning: California Is Being Mojavefied! In the short term, temperatures are expected to rise 10 to 15 degrees above average from the Upper Great Lakes to part of the Middle Mississippi Valley; in contrast, temperatures will be 10 to 20 degrees below average from the Northern/Central High Plains to the Great Basin/Central Rockies, said NWS. As of September 25, 2013, at least 1,345 counties and parishes, or 42.8% of all the U.S. counties and county equivalents, across 29 states remained agricultural disaster areas due to the drought, said USDA. US Drought Map as of September 24, released by US Drought Monitor on September 26, 2013. The Midwest: “By September 22, topsoil moisture was still rated by the U.S. Department of Agriculture at least half very short to short in Iowa (77%), Missouri (69%), Illinois (66%), South Dakota (62%), Nebraska (61%), and Wisconsin (55%). On the same date, USDA rated at least half of the pastures in very poor to poor condition in Iowa (62%) and Wisconsin (58%). And, more than one-quarter of the corn and soybeans were rated very poor to poor in Wisconsin (29 and 29%, respectively), Missouri (27 and 33%), and Iowa (27 and 29%).” U.S. Drought Monitor reported. As of September 10, 2013 about 63.75 percent of land area in the contiguous U.S. was covered by D0-D4 drought conditions, up from 61.71 percent last week, while more than half of the country was in moderate drought condition or worse, with about a third experiencing severe, exceptional or extreme drought levels, according to the U.S. Drought Monitor. US Drought Map as of September 10, released by US Drought Monitor on September 12, 2013. As of September 11, 2013 at least 1,338 counties and parishes, or 42.41% of all U.S. counties and county equivalents, were designated as agricultural disaster areas due to the ongoing drought. The Northeast: Continuing dry conditions prompted the introduction of abnormal dryness (D0) across central Maryland, southwestern Connecticut, and Long Island, N.Y., this week. According to AHPS, these areas have significant precipitation deficits at 180-, 90-, 60-, 30-, and 14 days. Streams and rivers are also running low, especially in central Maryland. The Midwest: Most of the Midwest remained dry this past week… Positive temperature departures of 4-8 degrees F were common throughout the region, with +10 degree F anomalies over portions of Iowa and southern Minnesota … widespread 1-category downgrades were made to the drought depiction across northern and southwestern Missouri, southern, central and eastern Iowa, parts of northern Illinois, northeastern and central Indiana, and central and southern portions of both Minnesota and Wisconsin. The Lower Mississippi Valley: Lack of rain during the past 7-days, temperatures 2-6 degrees above normal, and stream flow values in the lowest quartile of their historical distributions prompted 1-category degradations to the depiction across northern and western Louisiana, central and southern Arkansas, and northern and central Mississippi. Central and Northern Great Plains: One-category downgrades were warranted across southeastern Nebraska … In Kansas, the area of abnormal dryness (D0) in the northeast was expanded, and D0 conditions were added to southeast parts of the state. Southern Great Plains: Continuing dryness over north-central and northeastern Texas warranted a number of 1-category degradations. Texas, as dry weather has followed a reasonably wet summer in the region. In Oklahoma, 1-category downgrades were made across a significant portion of the state, with remaining drought-free areas in central and eastern Oklahoma deteriorating to abnormal dryness (D0). In Jackson County (southwest part of state)… Lake Altus-Lugert dropped to a historic low level of 12.6 percent of capacity. The Northwest: … the short-term gains have not offset long-term precipitation deficits… no change… in this area. On the west side, it was reported that livestock and ornamental producers were having to haul water to sustain operations, which is very expensive and significantly reduces profits. On the southeast side of the Island, there were reports of crop stress. Alaska: No changes were made in Alaska this week. Severe drought in Iowa increased to 32.07 percent up from 22.4 percent a week earlier, with 63.24 percent of the state covered in moderate drought or worse. “After such an ideal start to the growing season, the past two months have been much drier than usual, with temperatures slowly increasing,” said David Miskus of U.S. Drought Monitor. Precipitation in central Iowa and northern Missouri was only 5 to 25 percent of normal, and as little as a tenth of an inch of rain. Iowa recorded its warmest week since July 2012, with highs of 104 degrees Fahrenheit at Des Moines and Fort Madison on Aug. 30. Iowa experienced its seventh driest August in 141 years of records, following the ninth driest July. Crop and pasture conditions began to deteriorate rapidly once heat was added to the dryness. Small areas of severe drought also showed up in Illinois, Minnesota and Wisconsin this week. Drought also expanded or intensified in Mississippi, Oklahoma and on the Hawaiian island of Maui, during the week. The portion of the drought-stricken areas in the U.S. corn belt increased from 45 to 52 percent during the week ending September 3, according to the U.S. Department of Agriculture’s meteorologist Brad Rippey, the report said. Soybeans in drought also increased in the last week, from 38 to 42 percent. Corn and soybeans in drought bottomed out in July at 17 and 8 percent, respectively. Cattle in drought increased one percent to 53 percent. “Given that U.S. producers planted an estimated 97.4 million acres of corn and 77.2 million acres of soybeans in 2013, current drought figures suggest that more than 50 million acres (nearly 80,000 square miles) of corn and some 32 million acres (more than 50,000 square miles) of soybeans are presently being affected by drought,” Rippey said. As Midwest continued to dry out, parts of the Southwest and West saw scattered improvements from the monsoon season. Overall, the portion of the contiguous United States in moderate to exceptional drought crept up to 50.09 percent from 50.04 percent a week earlier. The total land area in moderate drought increased to 17.69 percent, up from 16.67 previously. The area in exceptional drought shrank to 1.25 percent, down 0.07 percent from last week. Drought and abnormally dry conditions covered about 62.34 percent of contiguous United States, up from 59.98 percent a week earlier. The percentage of land areas in the lower 48 covered by “Extreme” and “Exceptional Drought” levels remained nearly unchanged, while the total areas covered by “Severe” and “Moderate Drought” levels increased by about 4.43 percent. Meantime, USDA designated 39 additional counties in 5 states as agricultural disaster areas due to damage and losses caused by the recent drought. Abnormally Dry to Severe Drought levels spread in the contiguous United States, while areas covered by Extreme to Exceptional Drought levels retreat. US Drought Map as of August 20, 2013, released by US Drought Monitor on Thursday August 22, 2013. U.S. Drought Disaster Map as of August 21, 2013. At least 1,333 counties, or 42.41% of all U.S. counties*, were designated as agricultural disaster areas due to the ongoing drought, a rise of 0.41% (16 counties) since last week. [The figure includes both primary and contiguous disaster designations.] Source: USDA. Map enhanced by FIRE-EARTH. As of August 13, 2013 about 57.30 percent of contiguous United States were affected by drought conditions, down slightly from 57.40 percent a week earlier. Some 45.26 percent of the land areas were covered by Moderate Drought (D1) to Exceptional Drought (D4), down from 45.49 percent. US Drought Map as of August 13, 2013, released by US Drought Monitor on August 15, 2013. As of August 14, 2013 at least 1,317 U.S. counties were designated as primary or contiguous agricultural disaster areas due to the ongoing drought. U.S. Drought Disaster Map as of August 14, 2013. At least 1,317 counties, or 42% of all counties*, were designated as drought disaster areas. [The figure includes both primary and contiguous disaster designations.] Source: USDA. Map enhanced by FIRE-EARTH. Areas covered by various drought levels in contiguous United States expanded marginally in the week ending August 6, 2013. D0 – D4 Drought levels covered 57.40 percent of the lower 48, up from 57.23 percent previous period. The region worst affected by the drought was the South, where Exceptional Drought expanded to 3.75 percent, up from 3.04 percent earlier. The region’s D0 – D4 drought levels also expanded to 74.44 percent, up from 73.81 percent a week earlier. US Drought Map as of August 6, 2013, released by US Drought Monitor on August 8, 2013. Drought intensified in the U.S. West over the past week. D0-D4 drought levels generally persisted in California, Colorado, Idaho, Louisiana, Montana, Nebraska, Wyoming, Arizona, Alaska and Hawaii, but eased slightly in Texas and New Mexico. Drought conditions improved more significantly in Oklahoma, covering 52.77 percent of the state, down from 75.08 percent previously. In Arkansas, D0 – D2 drought areas were 71.01 percent, down from 90.94 percent last period. Kansas down to 87.80 percent, compared with 100 percent a week ago. As of July 30, 2013, drought levels in the lower 48 improved slightly covering 57.23 percent of contiguous U.S., down from 58.30 percent previously. Dry conditions in Iowa covered 70.18 percent of the land, up from 62.92 percent earlier. The areas in contiguous U.S. that are covered by ‘Abnormally Dry’ thru ‘Exceptional Drought’ (D0 – D4 on the Drought Monitor scale) have expanded to 58.30 percent for the week ending July 23, 2013, up from 54.39 percent a week earlier. Abnormally dry areas in the U.S. Midwest, including the top crop state of Iowa, reached 18.94 percent, up from 7.16 percent. Iowa has experienced a triple fold increase in the areas covered by abnormally dry condition, reaching 62.9 percent, compared to 19.8 percent earlier. Dry conditions have also expanded in Arkansas, Louisiana, Minnesota and Missouri. Five additional Montana counties have been designated as agricultural disaster areas due to damages and losses caused by the expanding drought. US Drought Map as of July 23, 2013, released by US Drought Monitor on July 25, 2013. About 64 percent of the topsoil in Arkansas was rated short or very short of moisture, with 24 percent of the state’s pasture and rangeland in poor or very poor condition. California had 95 percent of its pasture and rangeland in poor or very poor condition. Colorado 64 percent, Kansas 55 percent, Texas 44 percent and Arizona had 79 percent so rated, according to July 22 U.S. Department of Agriculture crop progress report. The U.S. Department of Agriculture (USDA) has designated a total of 19 counties in four states—Colorado, New Mexico, Texas and California—as agricultural disaster areas due to damages and losses caused by the ongoing drought. The latest designations, issued on June 26, include both primary and contiguous disaster areas. Rio Grande and Saguache counties. New Mexico: Rio Arriba and San Juan counties. California: San Diego, Imperial, Orange and Riverside counties. Texas: Reeves, Culberson, Jeff Davis, Loving, Pecos and Ward counties. U.S. Drought Disaster Map as of June 26, 2013. A total of at least 1,267 counties across 28 states are currently designated as [primary or contiguous] drought disaster areas. USDA has designated 31 additional counties across seven states as Agricultural Disaster Areas due to damages and losses caused by several ongoing drought. The designations include both primary and contiguous disaster areas. A total of at least 1,266 counties across 28 states are currently designated as [primary or contiguous] drought disaster areas. 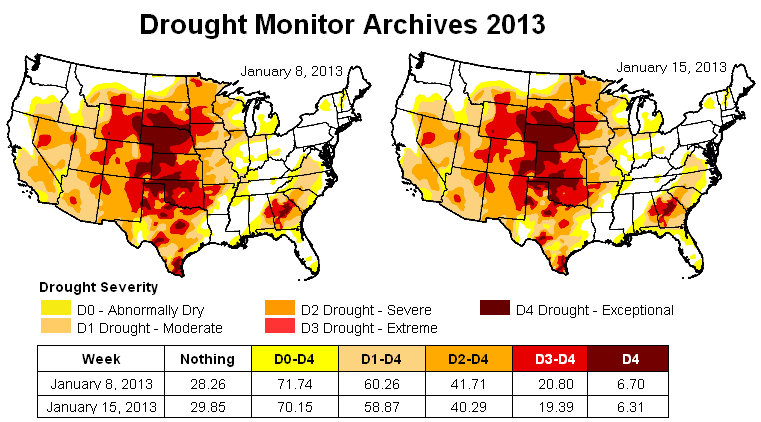 U.S. Drought Disaster Map as of June 12, 2013. A total of at least 1,266 counties across 28 states are currently designated as [primary or contiguous] drought disaster areas. [January 26, 2013] Mass die-offs resulting from human impact and the planetary response to the anthropogenic assault could occur by early 2016. Severe flooding, triggered by week-long extreme rain events in South Africa and Zimbabwe, continued to spread across southern Mozambique. Hunger is setting in among tens of thousands of the victims who are waiting for help to arrive, said a report. “We have family in the town, our aunts. They must be on the rooftops now,” she said. A crocodile farm in northern South Africa was forced to open its gates after being inundated, letting loose at least 15,000 crocodiles. Several ‘mini-tornadoes’ spawned by the remnants of cyclone Oswald have hit the Queensland coast injuring about two dozen people, as severe weather and flooding batters the disaster state. The tornadoes have damaged scores of homes and forced the evacuation of towns around Bundaberg, reports said. Tornadoes caused severe damage to coastal townships of Bargara and Burnett Heads, both of which have since been declared disaster areas. Further north, severe flooding in Gladstone led to the city (population ~ 30,000) being declared a disaster zone, and the authorities told at least 2,000 people to evacuate. The drought in Oklahoma has caused more than $2 billion in damage in the past two years, said a report. 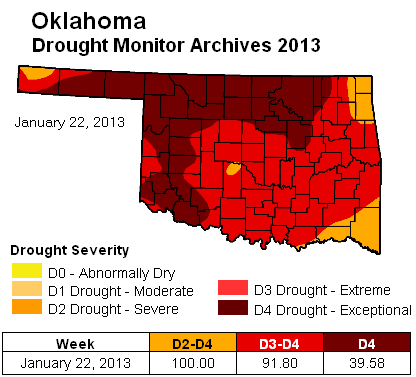 USDA has declared 917 counties as primary and contiguous drought disaster areas including the entire state of Oklahoma and parts of 25 other states, in January 2013. Severe drought has spread to 87.25 percent of the High Plains, up from 86.20 percent previous week, with 61.27 percent of the region rated in extreme drought, up from 60.25 percent. 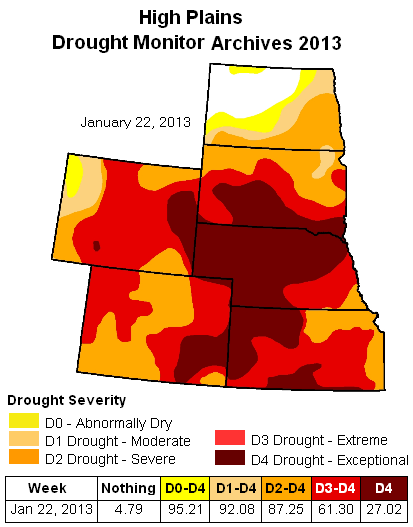 The entire land area in Colorado, Kansas, Nebraska and Oklahoma is currently affected by severe drought or worse. U.S. Drought Map for 15 January 2013, released by U.S. Drought Monitor on January 17, 2013. About 58.87 percent of the contiguous United States was in at least “moderate” drought as of January 15, according to the U.S. Drought Monitor. About 16,000 residents in rural Payne, Pawnee, and Lincoln counties are running out of water, prompting emergency managers to declare states of emergency. The water level at Lone Chimney Lake, the area’s only source, has dropped under four feet—11.5 feet below normal, reports said. “Last summer’s extreme weather locked two-thirds of the U.S. continental land mass in severe drought, cutting production of the biggest crop, corn, by 27 percent from early-season estimates,” said a report. [January 18, 2013] Mass die-offs resulting from human impact and the planetary response to the anthropogenic assault could occur by early 2016. [January 17, 2013] Mass die-offs resulting from human impact and the planetary response to the anthropogenic assault could occur by early 2016. The U.S. Department of Agriculture (USDA) has designated dozens of additional counties across 8 states as drought disaster areas. The designations include both primary and contiguous disaster areas. The latest designations are for counties in the states of Texas, Oklahoma, Nebraska, Missouri, Kansas, Georgia, Florida and Alabama. Drought Disaster 2013 has now spread to at least 904 counties across 27 states: Alabama, Arizona, Arkansas, California, Colorado, Florida, Georgia, Hawaii, Idaho, Illinois, Iowa, Kansas, Minnesota, Missouri, Montana, Nebraska, Nevada, New Mexico, North Carolina, North Dakota, Oklahoma, Oregon, South Carolina, South Dakota, Tennessee, Texas and Wyoming. A state of emergency was declared by the new governor of Jakarta as severe flooding triggered by days of heavy rain inundated large parts of the Indonesian capital Jakarta, blocking roads and forcing up to 100,000 people from their homes. Many businesses and government offices, especially in the capital’s central business district, were forced to close because staff could not get to work. Dozens of schools have told their students to stay at home. At least half dozen people have been killed in the extreme rain and flood-related incidents so far. “Rain will continue to fall in the greater Jakarta area … the potential for flooding remains,” a spokesman for the Meteorology Climatology Meteorology and Geophysics Agency told Reuters. [January 13, 2013] Mass die-offs resulting from human impact and the planetary response to the anthropogenic assault could occur by early 2016. The U.S. Department of Agriculture (USDA) has declared as drought disaster areas dozens of counties across Minnesota, Montana North and South Dakotas. The designations follow damages and losses caused by the recent drought. New York State has declared a public health emergency, as a severe influenza outbreak tightened its grip across the country. About 20,000 cases of flu have been reported statewide so far this season, a rise of nearly 4 folds on the last season (4,400 confirmed cases in 2012). “We are experiencing the worst flu season since at least 2009, and influenza activity in New York State is widespread, with cases reported in all 57 counties and all five boroughs of New York City,” Governor Cuomo said in a statement. “Therefore, I have directed my Administration, the State Health Department and others to marshal all needed resources to address this public health emergency and remove all barriers to ensure that all New Yorkers – children and adults alike – have access to critically needed flu vaccines Gov. Cuomo said . Public health officials in NY announced last week that flu-related illnesses had reached epidemic levels, killing at least 20 children nationwide. Forty-seven states reported widespread geographic influenza activity for the week between December 30, 2012 and January 5, 2013. CDC estimates that from the 1976-1977 flu season to the 2006-2007 season, flu-associated deaths each season ranged from a low of about 3,000 people to a high of about 49,000 people. Twenty-four states and New York City are now reporting high ILI activity. Additionally, 16 are reporting moderate levels of ILI activity. States reporting high ILI activity for the week ending January 5, 2013 include Alabama, Colorado, Delaware, Georgia, Illinois, Iowa, Kansas, Louisiana, Michigan, Minnesota, Mississippi, Missouri, New Jersey, New Mexico, North Carolina, North Dakota, Oklahoma, Pennsylvania, Rhode Island, Tennessee, Texas, Utah, Virginia, and West Virginia, CDC said. FEWW DROUGHT FORECAST: REMOVED BY A MODERATOR. As of January 8, 2013 drought covered more than 60 percent of the contiguous U.S. and rendered a further 11.5 percent as ‘Abnormally Dry,’ according to the U.S. Drought Monitor. More than half of southern United States including the entire state of Oklahoma and about two-thirds of Texas were also experiencing ‘Severe’ to ‘Exceptional’ drought conditions. At least 44 percent of the West, a third of the Midwest and a fifth of the Southeast also reported similar drought conditions. 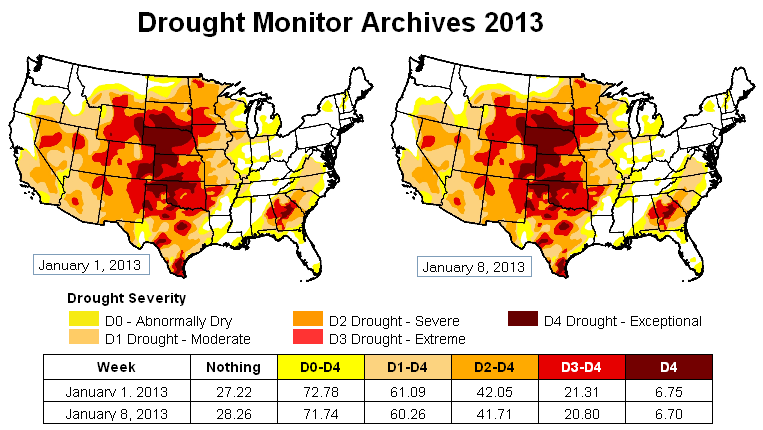 U.S. Drought Map for 8 January 2013, released by U.S. Drought Monitor on January 10, 2013.